After a few days of feasting on Western style food, my Asian heritage starts to crave for something hot and spicy. 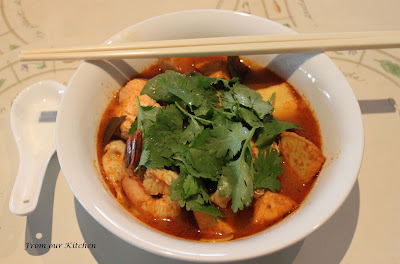 Whilst my two girls and hubby tucked into their creamy pasta with salmon, I enjoyed my bowl of steaming hot and spicy Tom Yum Goong with salmon, prawns, fish tofu and two types of mushroom - oyster and button, garnished with coriander. Delicious! It was a quick and easy to prepare as I used the Tean's Gourmet Tom Yum paste and added lemongrass (from my herb garden) and kaffir lime leaves, plus some chopped red chillies (also from my herb garden) for some heat. btw, i didn't know you can get Tean's easily in Au. i sent a whole box to my friend in Perth. I love their ready mix. I know what you mean, I am now waiting for my Asian dinner as well to come (just ordered something ;)). Tom Yum Goong sounds just great! Hot and spicy and a tinge of sourness never fails to satisfy. Elaine: It's easy to buy Tean's paste varieties in Sydney. I use them quite often because it's so much more convenient. We can also buy A1 brand pastes here too. i agree!! I love pastes like this. It makes a simple dinner taste delicious!!! and here is my recipe, which I use and the soup I prepare is exactly the same, that I’m used to in Thailand. The base of classic Tom Yum Goong is chicken stock, but many cooks in Thailand use beef stock or even their mixture as well. Bring the stock to boil. First step: prepare galangal, lemongrass and kaffir lime leaves. Slice galangal and lemongrass and add them to stock with kaffir lime leaves. Then bring your stock back to boil. Second step: add mushrooms, fish sauce and chilli paste. Third and last step: Remove shells from prawns except tails and put them to stock. Press juice out of limes and add sliced chili peppers. As soon as prawns turn red add coriander and your first true Tom Yum is ready.